Warm. Elegant. Peaceful. A perfect place to engage nature. Reminiscent of a traditional African safari camp, Kaingo Elephant Lodge offers a luxurious safari accommodation experience. 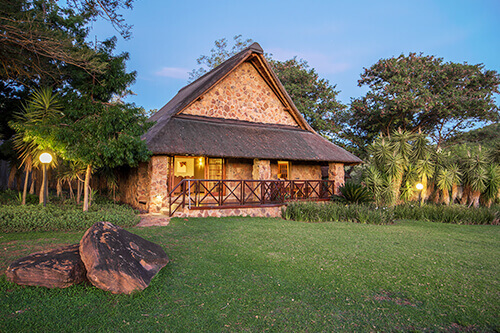 Built from natural stone with thatch roofs, the lodge has an olde worlde-Africa atmosphere while being completely contemporary. All comforts are catered for in the plush suites and throughout this carefully appointed luxury safari lodge, surrounded with nature inspired décor and accent colours. Just 28 guests in total can be accommodated at Elephant Lodge, with the focus on personal attention, superb service and complete comfort. 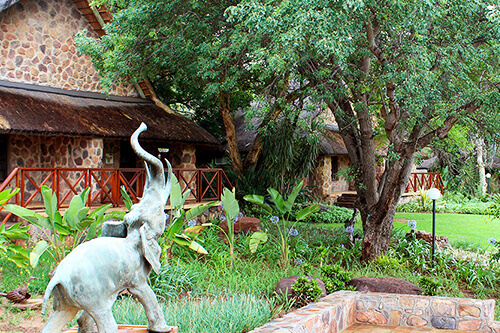 Elephant Lodge is equipped with complimentary Wi-Fi for lodge guests wanting to connect to home. 12 Authentic Safari rooms for 24 guests. 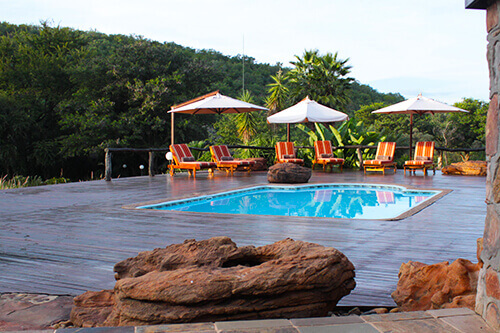 Leopard House: 2 bedrooms for 4 guests, private lounge, dining, pool, outside relaxation areas. Large communal areas with pool, bar, lounges, library, meeting room and relaxation decks. Large garden with botanical route. Full range of dietary preferences catered for. Secure under roof parking for guest vehicles. Cell phone signal available (unreliable at times). Garden paths connect the suites to each other and to the main lodge area. Elephant Lodge is set among tall shady trees where you can enjoy a botanical experience of trees, cycads and natural plants. The large pond and surrounding grazing attracts a wide selection of birds and antelope right to your doorstep.  Each en-suite room has an African wildlife theme and can accommodate two people in either double or twin beds, dressed in white linen and African throws. There’s air conditioning for summer and heated under blankets to keep the cold at bay on winter nights. Everything and more than you’d expect in a luxury safari lodge – including a lock-up safe in each suite. Earthy colours, leather and dark wood finishes give the suites an understated elegance. or families there are side-by-side interleading en-suite rooms which make for a memorable holiday. It has two en-suite bedrooms, together with a lounge and dining area, and walls adorned with original works of art. A private outside patio area features a plunge pool, thatched lapa and fire pit area where meals and quality time can be enjoyed in privacy, if so preferred. Everything you’d expect in a luxury safari house is here. Earthy colours, leather and dark wood finishes give this unit a nostalgic air. An intimate library nestles under a thatched roof with air-conditioning, which creates a welcomed freshness in summer. The fireplace ensures a warm and cozy atmosphere during cooler winter evenings. It’s the perfect place to sink into a comfortable sofa, while enjoying refreshments from the Elephant Bar. 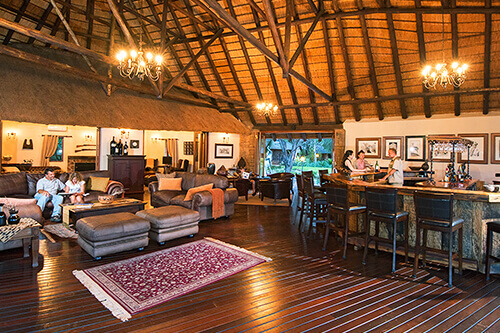 Relax in the Elephant bar and lounge nestled under a large vaulted thatched roof with open sides, which also creates a welcomed breeze in summer. The deck is the ideal place to relax around the fire after an eventful day in the bush. A place to spend some lovely times exchanging stories with your family, friends, fellow guests and hosts. 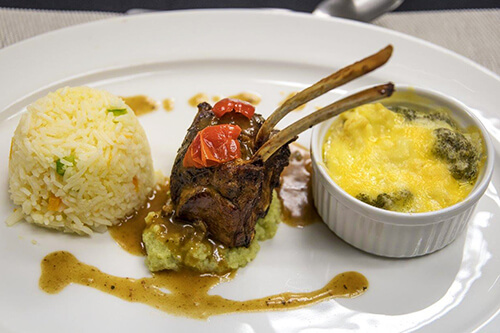 The olde worlde-Africa atmosphere is carried through to the meals. Breakfast and lunch are served under a canopy of thatch or under the trees in the beautiful garden, while dinner is usually enjoyed in the rustic outdoor boma, around a roaring open fire (depending on the weather, dinner may also be served indoors). This is true African-style dining in a luxury safari lodge setting, with the roar of lions and the calls of jackals and nightjars as natural background ambiance. Then, sun-dry on the loungers before taking a lazy nap in the shade under a wide canvas umbrella. 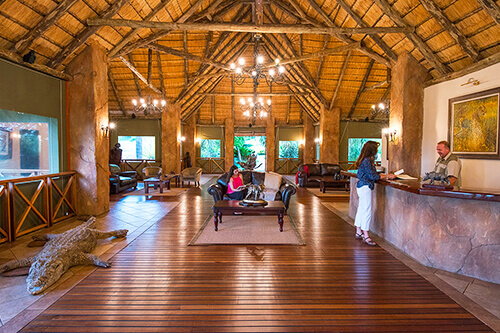 Enjoy the magnificent vaulted thatch structure and works of wildlife art. Our executive conference facility can cater for smaller conferences or events and offers total exclusivity. "Unbelievable! Hospitality Indescribably Wonderful! Rest And Peace For The Soul. Thank You. We'll See You Again."